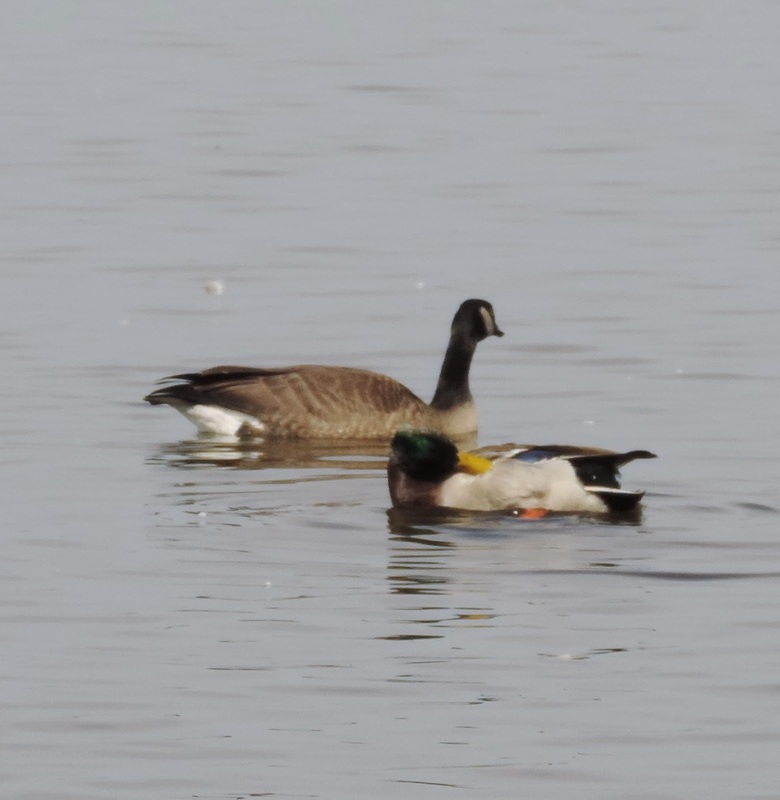 An excellent overview of this split was provided by OMNR waterfowl expert, Ken Abraham, in the winter of 2005. Here’s the link: http://www.ofo.ca/site/page/view/articles.cacklinggoose. I will attempt to make this discussion as clear, digestible, and casual as possible, but if anything is unclear, please email me at eontbird@gmail.com and I would be happy to go over material. Below I provide an identification overview of “Richardson’s” (hutchinsii) Cackling Geese, Myth Busting, and Quiz photos. Figure 1: Ontario’s Cackling Geese: an example of five “classic” hutchinsii Cackling Geese. Note the diminutive size overall; steep forehead; relatively short, stout bill; proportionally small head with “blocky” shape in most postures; short and stubby neck (especially in a relaxed posture). 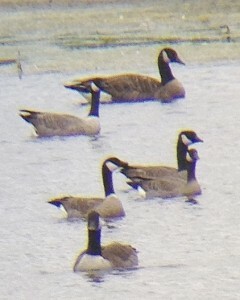 Though not shown in this photo, the upperparts often average slightly paler than Interior (interior) Canada Geese and sometimes show broad, pale emarginations throughout, leading to a scalloped appearance. Andrew Haydon Park — 1 October 2013. Figure 2: More prototypical hutchinsii Cackling Geese, with three interior Canada Geese at back. 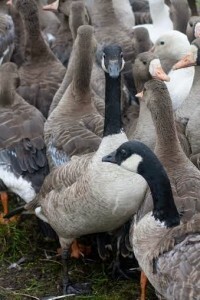 Once small-bodied white-cheeked geese are located in a flock of geese, Cackling Goose ID begins from the head down. A primary identifier is the head and bill morphology; you can ID even the larger male hutchinsii with confidence once you dial the head and bill morphology into your search image. Andrew Haydon Park — 1 October 2013. 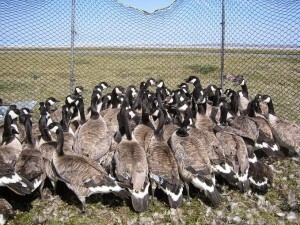 Figure 3: A flock of 25 hutchinsii Cackling Geese. 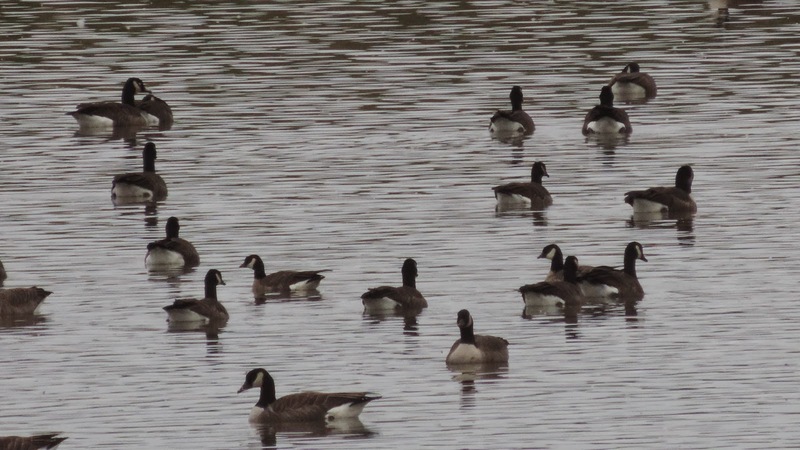 Note how they “bundle” up and form a sub-flock within a flock; this is often the case and often by looking for sub-groups, one can get on geese of special interest within a flock of Canada’s. Almonte Sewage Lagoons — 10 October 2014. Most hutchinsii are well above Mallard-sized and some approach (and even overlap) small female interior Canada Geese in weight (Jim Leafloor, pers. comm. October 2014). Mallard-like size and a very stubby bill is far more typical of westerner, minima, than nominate hutchinsii (Steve Mlodinow, pers. comm. September 2015). Applying biogeographical concepts, i.e. Bergmann’s Rule: the southern cohorts average more robust and larger-bodied than do the northern ones. Perhaps then the cacklers that appear to be near-Mallard-sized originate from more northerly cohorts. Males are larger than females and, in general, hutchinsii vary tremendously in mass (Mowbray 2002). For example, a large male Richardson’s from the southern portion of the breeding range compared to a female from the Baffin Islands…..quite the difference, structural and size-wise, between the two. Mowbray et al. (2002) give a range in the mean weight of males from north to the south of 1.92–2.38 kg and for females 1.65–2.10 kg. Consider a large male (2.38 kg) compared to a small female (1.65 kg). Figure 4: An example of variation in size and structure in eastern hutchinsii Cackling Geese. I find that I observe the large, “blocky” head and “Roman’s Nose” bill on presumed males more than I do with petite, presumed females. I noted these two as a pair: they swam together for several hours. Almonte Sewage Lagoons — 10 October 2014. 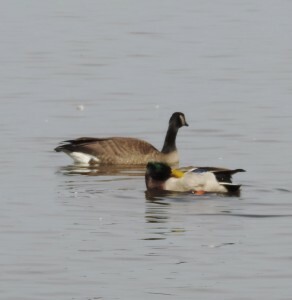 Figure 5: A juvenile interior Canada Goose with a male Mallard. This photo provides an example of the smaller size of these more northern Canada Geese.To note, juveniles are, on average, 90% the size of adults (Ken Abraham, pers. comm. October 2013) so this particular specimen is on the small end of the spectrum for a typical interior Canada. Andrew Haydon Park — 1 October 2013. 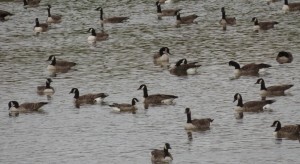 Figure 6: A hutchinsii Cackling Goose (at left) with a diminutive interior Canada Goose essentially overlapping in mass. Both are close to shore and fully alert (outstretched necks, etc). Note the difference between the two with regards to neck length and girth; bill morphology; pale feather edgings throughout the upperparts (emarginations); breast coloration; head size and shape. Andrew Haydon Park — 1 October 2013. Compared to other subspecies of Cackling Geese, the bill on hutchinsii averages long and thin, often showcasing a slight droop nearest the tip. Occasionally, the bill is very short and triangular like the westerner, minima (Mlodinow et al. 2008). Figure 7: A necklaced cackler. At the time, I thought I may have come across some sort of western subspecies. I sent Ken Abraham (OMNR Waterfowl expert) an email and he responded: “In a sample of fall migrant B. hutchinsii from Thunder Bay that I examined in 2005-2006, 23 of 82 had good white neck rings. 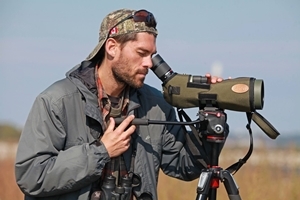 Banding data have linked those birds to Baffin Island. I don’t know what the percentages are from other areas within the Cackling goose breeding range, but I suspect they are not uncommon. Occasionally one will have the very strong markings that your bird shows.” Carp River Floodplain — 16 November 2013. Cackling Geese with gently sloped foreheads and rounded, dome-like crowns can be seen throughout a season of goose-watching here in eastern Ontario. 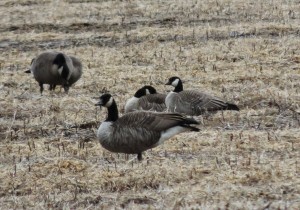 I believe these geese hail from mid-western Arctic populations (what western birders term “parvipes”). From a strictly eastern Ontario perspective, I do not subscribe to classifying these birds as a separate subspecies; to me, it appears quite possible that there’s a gradual cline towards more “parvipes”-like characteristics of breeding birds throughout the mid-western Arctic. 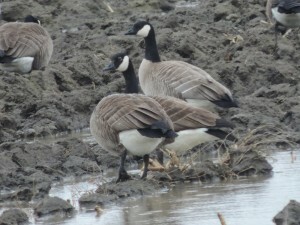 For a detailed overview of the occurrence of B. c. parvipes here in Ontario, please refer to Ken Abraham’s article: http://www.ofo.ca/site/page/view/articles.cacklinggoose. Figure 9: A photo of a probable Cackling Goose (at rear) that is not safely identifiable to subspecies. The “gentle”, elegant expression of this bird is a far cry from the typical blocky-headed, stocky hutchinsii Cackling Goose. Note the smooth transition from the base of the bill to its crown, which is rounded, or, “domed” in appearance. The rear of the crown lacks the peak that is often seen on hutchinsii cacklers; instead, what is seen is a smooth and rounded finish. I followed this bird through a variety of postures and this “look” was maintained throughout. Structurally, this bird looks quite similar to the birds in the photos from Queen Maud Gulf, Figure 10 (see below). Richmond, Ontario — April 2014. 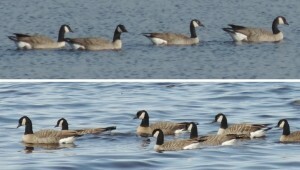 Figure 10: Six Cackling Geese showcasing the drooping “Roman’s Nose” bill that is often seen with hutchinsii Cackling Geese but also with gently-sloped foreheads and smooth, dome-shaped crowns. The necks are ever so slightly thinner than avg hutchinsii, availing an elegant expression. 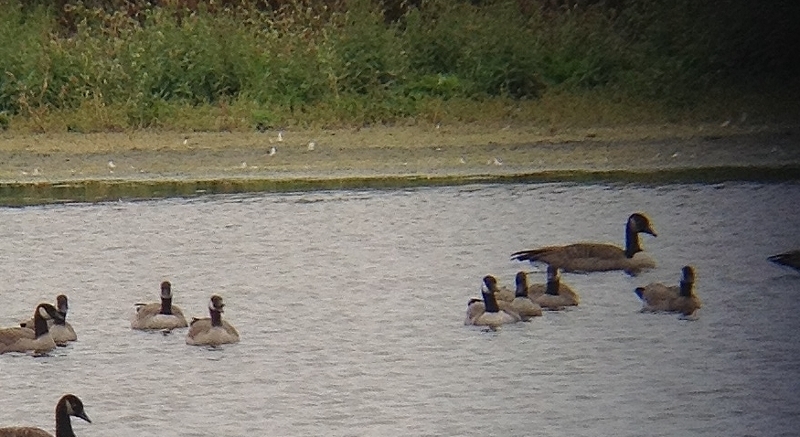 Examine the size difference compared to the two interior Canada Geese (at front right). Are they cacklers? Where from? Almonte Sewage Lagoons — 6 October 2014. Figure 12: Cackling with Greater White-fronted Geese – central arctic (mainland south of Queen Maud Gulf). 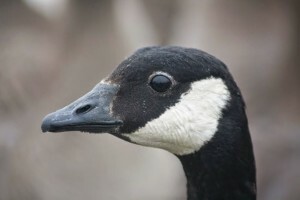 Figure 13: A close-up head-shot of a Cackling Goose – central arctic (mainland south of Queen Maud Gulf). Figure 14: Cackling Geese – all with outstretched necks, showcasing alert postures. Southampton Island, Nunavut, Canada. Many thanks to Ken Abraham and Jim Leafloor for allowing me to showcase these photographs on my site. 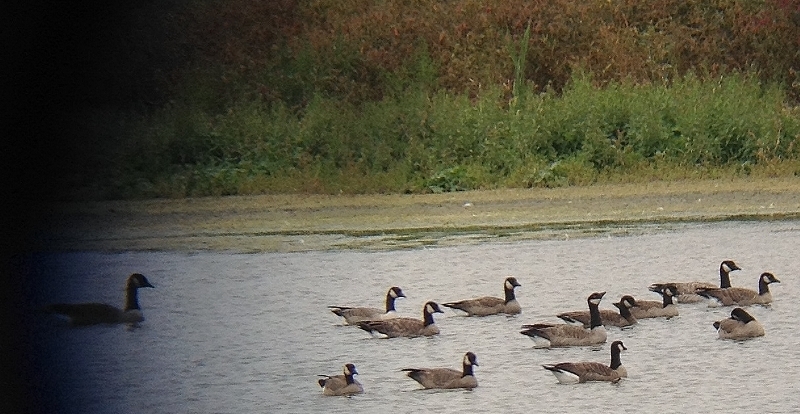 6 Cackling Geese and 3 Canada Geese. Note the two cacklers at left…they are juveniles (dusky wash throughout; dusky breast; some dusk in the cheek patch). I believe the bird at the center is also a juv. 4 Cackling with 3 Canada. The “blocky” head shape is really coming through on one of these cacklers; can you see it? Same 4/6 as above. 4 Cackling, 2 Canada. Same birds as above. This short article offers some current, original identification insights but is for the most part a regurgitation of information shared with me over two study periods (Fall 2013 and 2014). 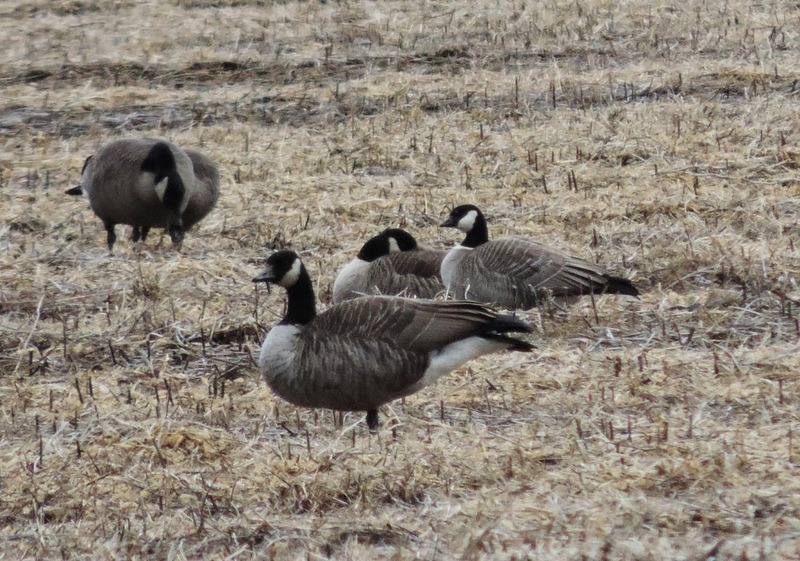 Many thanks to Jim Leafloor and Steve Mlodinow for reviewing this article and thanks to Ken Abraham, Mark Gawn, and Ron Pittaway for their identification assistance and for sharing their information derived from field observations of Canada and Cackling Geese over many years of study. Leafloor, J.O., and D.H. Rusch. 1997. 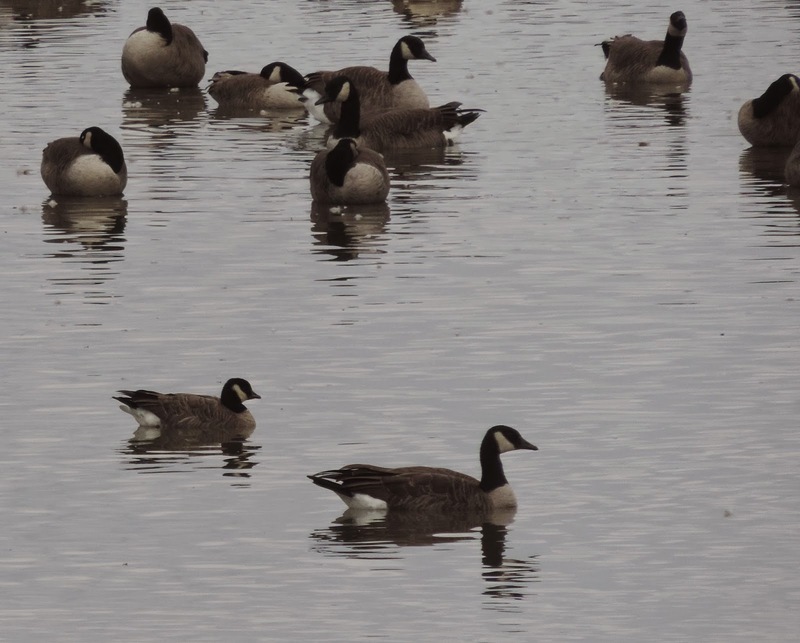 Clinal size variation in Canada Geese affects morphometric discrimination techniques. Journal of Wildlife Management 61: 183-190. Leafloor, J.O., J.A. Moore, and K.T. Scribner. 2013. 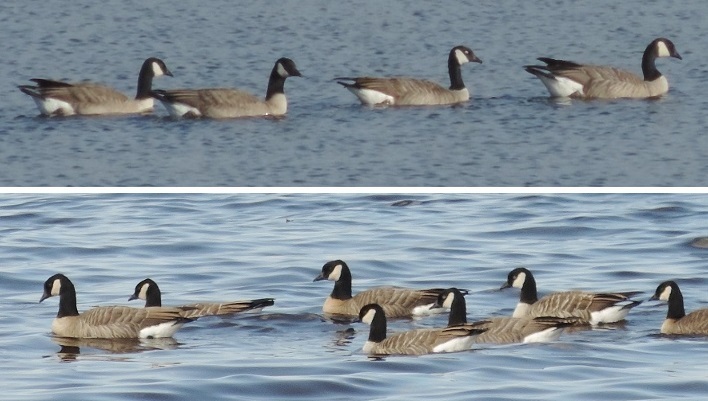 A hybrid zone between Canada Geese (Branta Canadensis) and Cackling Geese (B. hutchinsii). The Auk 130(3): 1-14, 2013. Moser, T.J., and R.E. Rolley. 1990. 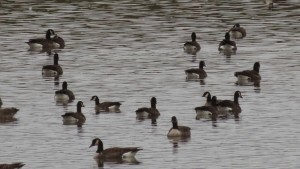 Discrimination of Giant and Interior Canada Geese of the Mississippi Flyway. Wildlife Society Bulletin 18: 381-388. Mowbray, T.B., C.R. Ely, J.S. Sedinger, and R.E. Trost. 2002. Canada Goose (Branta canadensis). In The Birds of North America, no. 681 (A. Poole and F. Gill, Eds.) Academy of Natural Sciences, Philadelphia, and American Ornithologists’ Union, Washington, D.C.
Pearce, J.M., and K.S. Bollinger. 2003. Morphological traits of Pacific Flyway Canada Geese as an aid to subspecies identification and management. Journal of Field Ornithology 74: 357-369.